Guys I realy need some help... I think that with this all information that we have now and breadbording a little we can do something usable. If all major components are in the upper side more than 60% of this circuit are reveled. Don't know if this will help... I've only seen the terms Pre- and De- Emphasis associated with RIAA equalisation in phono preamps. Given the vintage of the original, it makes sense to me that Tape and/or Vinyl hifi circuit techniques would have been used. Pre and De-emphasis can be as simple as a CR network giving treble boost on the way in to a circuit and a corresponding CR circuit giving treble cut at the output of the circuit. It's no great magic (forget RIAA by the way - the frequencies aren't interesting for guitar). I use exactly this approach to improve the signal to noise ratio of hissy pedals! It really helps with BBD Flangers and Chorus circuits. I had one of these in for a new DC socket. I did the repair while the owner was waiting so not much info. I did notice that the I.C. labeled as the booster has the number C042 but thats all i noticed. Dries from Solodallas here, I did (still doing!) the engineering on all the products. 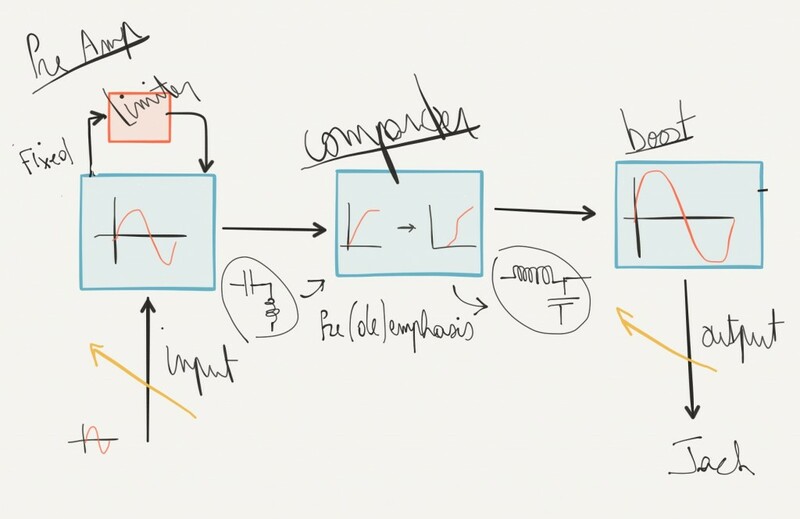 I actually made that block diagram drawing ! mictester wrote: Pre and De-emphasis can be as simple as a CR network giving treble boost on the way in to a circuit and a corresponding CR circuit giving treble cut at the output of the circuit. It's no great magic (forget RIAA by the way - the frequencies aren't interesting for guitar). I use exactly this approach to improve the signal to noise ratio of hissy pedals! It really helps with BBD Flangers and Chorus circuits. There's some app notes here in the pdf the last examples are of companding with pre and de-emphasis. Looking at the pedal it would seem the input pot is a input trim associated with the smd opamp and the output is associated with the dip 8 opamp... I'm sure they'd buffer that compander... I don't see the "optical" limiter in the pedal version. The replica guy talks of one over at the les paul forum. Just got caught up in the web form a rig rundown on you tube and ended at this wireless unit and the replica..
mojah63 wrote: I'm sure they'd buffer that compander... . In the application notes 1/2 of an opamp is used for pre emphasis before compression and the another 1/2 is used to de emphasis the expdander. Now could you do the pre + de emphasis just with passives... and is there enough passive components around that compander? Or maybe used the 1/2 of the 2nd op amp to de emphasize You need to account for the input gain control here. One trace goes to to the non or inverting input of 1/2 of the op amp. I can't see the pin 1 orientation mark in the pict. I only see two op amps and a compander on that board. So they are very limited on what they did actively. They also have an output boost, so there's probably 1/2 of an opamp too. Angus set his amp to have an overdrive and set the transmitter/receiver to boosts its overdrive. Almost all guitar players do the same with a booster pedal like ts9 that is a mid boost, if I use a linear boost like lpb1 or mxr microamp to boost a marshall amp we have harsh highs and blured basses but if I use the same in a Mesa boogie it sound great. Ts9 enphasise mids about 500 hz, Evh had used a eq pedal to boost mids about 800 hz, Brian May boosts 1.2 khz and I believe that svds isn't just a expander, It enphasise something between 300 and 500 hz, the question is: how? The answer is in filters I believe. EddieTavares wrote: Angus set his amp to have an overdrive and set the transmitter/receiver to boosts its overdrive. Almost all guitar players do the same with a booster pedal like ts9 that is a mid boost, if I use a linear boost like lpb1 or mxr microamp to boost a marshall amp we have harsh highs and blured basses but if I use the same in a Mesa boogie it sound great. I bought some ne571 and I breadbord this components a little and it works (a little too). I have seeing a lots of schematics that uses ne571 such as delays to understand that pedal, If something usable come up from this scratch It would never be a clone so forget about the values, every single value could be wrong. That part in the brown box Is the part that I have tried to understand, I know that is a signal booster with treble cut, I thought that It is a 741 inverting opamp but what is that cap in the pin 8? The input impedance is low because in the I read that it is about 50k, I believe that this is some of that secrets to smooth some frequencies, sounds strange in the pedal world. why 741 ? could it be a ne5534 ? that could be a compensation cap between pin 8 and pin 5. I would say, you are wondering in the dark without the back side of the pcb. karul wrote: I would say, you are wondering in the dark without the back side of the pcb. There is some pictures of the big one that shows no components in the dark side, I believe that they do It in the smaller one. Perfect, you are all correct, but those connections aren't too hard to suppose, the ne571 is used in the same way in almost all applications and the other circuit portions are two busters, one buffer between the compressor output and the expander input, pre/de-emphasis. I'm breadboarding this circuit, this preliminary circuit above sounds similar as I've listening in the samples on the internet but without the same amount of gain, I tried to increase the gain in both sides but it brings a terrible noise or just doesn't work. Not verified, but it's a start. What are R15 and R17 for? No Capacitor vor IC1B? C3 is a little small. No RC-Filter in the supply! underwood wrote: What are R15 and R17 for? No Capacitor vor IC1B? C3 is a little small. No RC-Filter in the supply!